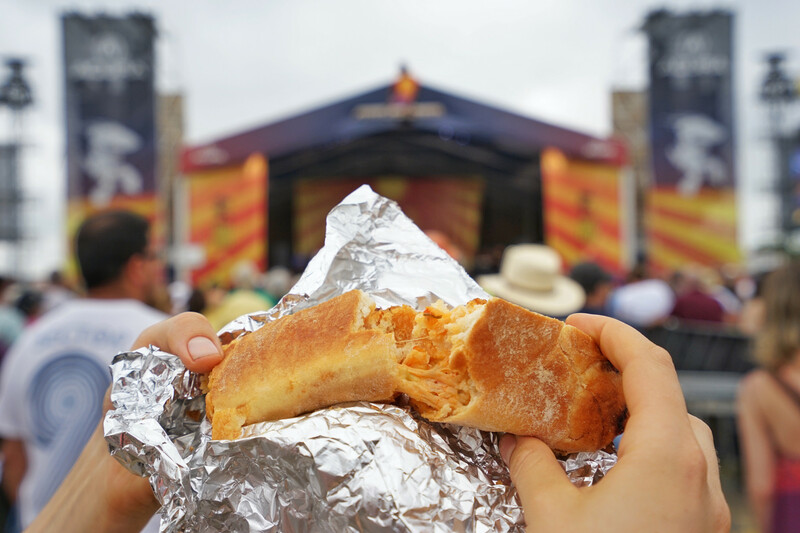 At the New Orleans Jazz & Heritage Festival, it’s as much about the food as it is the music. 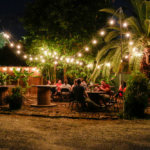 Sure, we love catching our favorite local artists as well as internationally-recognized headliners take the stage one after another during the eight days of the festival, but we’d be lying if we didn’t mention the food as a driving factor. 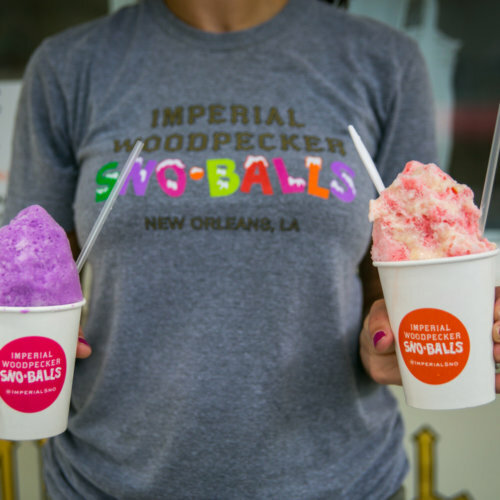 Jazz Fest offers dozens of different vendors, each serving up something uniquely delicious. For us lay-people, this is the only time and place to get that coveted dish. So, while you’re planning out your Jazz Fest music cubes, you might want to leave some room for meal time. Come hungry and bring some cash! 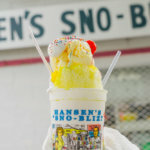 If you’re looking for a way to cool off, the mango freeze is a must. 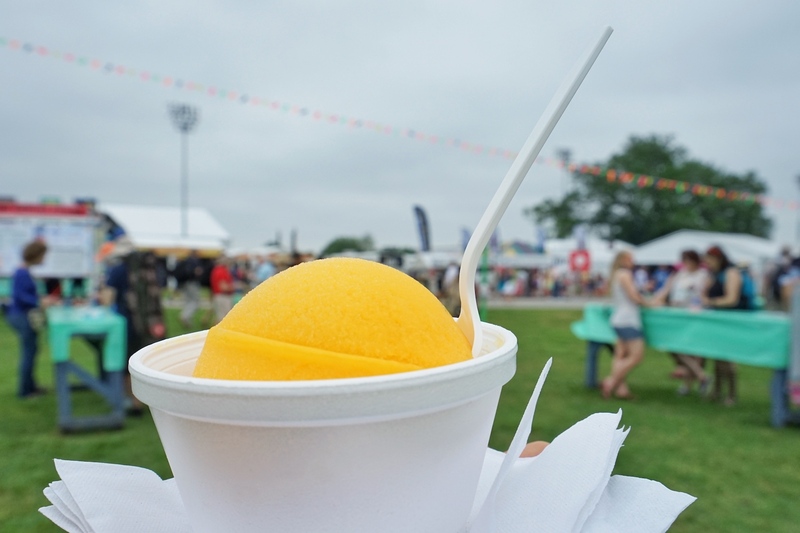 Only available at festivals, the mango freeze has become very popular over the years. It’s sweet, fruity and oh-so delicious, similar to sorbet. You can find it near the flagpole, across from Congo Square. Pro-tip: get the mango freeze and a can of Sofia sparkling wine, and combine the two for a truly wonderful late afternoon libation. We thought we had our favorite fest food ducks all in a row–cochon de lait po-boy, Crawfish Monica, soft-shell crab po-boy, and a crawfish sack–and so we would show up, space them out accordingly, and that was our routine down pat. 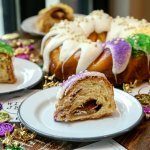 And all of those are very solid choices, but about six years ago, we were introduced to Creole Lunch House’s Creole Stuffed Bread, and our lives have never been the same since. It’s a perfect mixture of spicy Creole sausage stuffed inside this warm, pillowy, almost sweet bread. It’s heaven. Get that and a big old Rosemint iced tea (see below), and you are set. As soon as we hit the Jazz Fest Grounds, we head over to grab a big ol’ cup of delicious Rosemint Tea and hydrate for the day. You’ll find two options, one sweetened and one unsweetened, for those of you keeping an eye on the sugar. Get your favorite food (maybe one or two or three of our picks from above), a Rosemint tea, and then head out and take in all the magical sights and sounds of our favorite festival. 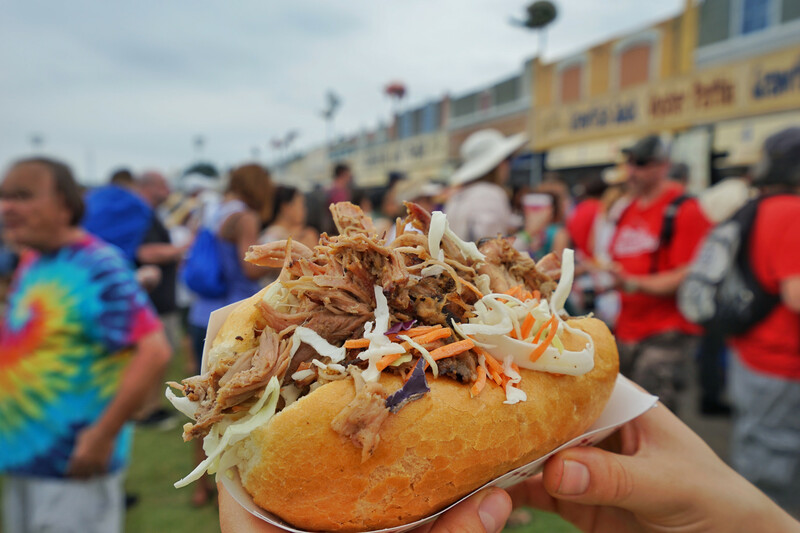 The Louisiana tradition of whole-roasting a pig (known as Cochon de Lait) finds its way into Jazz Fest through this staple. Pulled pork smoked for 13 hours, then topped with fresh cabbage and a special sauce, taking a bite into this po-boy is like chowing down on a tender slice of heaven. Trust us – you’ll be coming back for more. One of our early stops at Jazz Fest is undoubtedly to scoop up a bowl of Crawfish Monica. We never make it far past the booth before we dig into this creamy, pasta goodness dotted with tasty crawfish tails and Creole seasoning. And let’s be real – we are most likely going back for seconds before we exit the festival grounds. Here’s a little fun fact for you: the dish was created by Chef Pierre Hilzim who named it after his wife Monica. Thanks for the delicious inspiration, Monica! A combination of two of New Orleans’ sweetest treats, Praline Beignets from Loretta’s Authentic Pralines are a must. Made to order beignets stuffed with sweet praline filling and topped with powdered sugar is the perfect way to conclude a successful day of festing. Get a couple pralines for the road, whether you prefer chocolate, rum, or traditional. Cheesy bread and seafood are combined in this mouth-watering concoction. 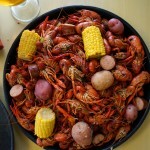 You’ll get a large portion of bread stuffed with crawfish tails, cheese, vegetables, and other goodies. Served hot and wrapped in tin foil, this is the perfect snack to get you through a long day, or to take home for later! Refreshingly delicious, this drink will hit the spot during a long day at Jazz Fest. The simple beverage requires the efforts of hundreds of volunteers to produce and distribute in large quantities. The best part: you can find it at multiple locations throughout the Fairgrounds, so you’ll never go thirsty.